Your wedding day is a day to wear something you wouldn’t typically get to wear. This is so true for the bride, but let’s not leave out our grooms! There are many different ways to make their suit or tux stand out! Which is why a current trend we here at Magnificent Moments Weddings are loving is the statement suit! While it has been a tradition for the groom and his groomsmen to be identical, those days are a thing of the past. 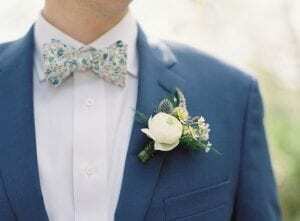 So it’s time to think outside of the box and make a literal statement with your grooms attire. After all BOTH the bride and groom have the freedom to stand out and steal the spotlight! Sound overwhelming and intimidating? Well we are here to break it down for you and help you make the most of your statement suit! What is a statement suit? The first thing you maybe asking is what the heck is a statement suit? Well a statement suit can be many things, but there is one thing it is not. A statement suit is not your typical black suit, white shirt, and black tie. The “statement” can be as small as a colored pocket square or patterned tie to a full colored or patterned suit. That’s the beauty in it, the statement you are making can be a bold or modest as you choose! Can I make a statement with the fabric? Yes! Everyone wants to look good at a wedding, but they also want to be comfortable. Changing the fabric of the groom and groomsmen attire can help with fashion and function! Have fun with it, bold patterns, textured fabric, bright ties. Don’t be afraid to add a little punch with your grooms wear fabric choices. How do I do this tastefully? So you think making a bold statement may be “too much”, well sometimes too much of a good thing, can be just too much. So when considering a statement suit, think of it as an accent to the overall design. If you go with a jewel tone suit, don’t feel like your flowers, tablecloths, and table toppers also need to be in that color. To keep things tasteful, use the color or pattern of the statement suit as subtle touches throughout your design. For smaller accents, consider a floral tie, leather suspenders, or a colored pocket square. You could also do a unique boutonniere for all the groomsmen. 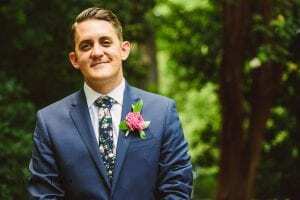 Check out our blog on boutonniere’s here. The bridal party as a whole can add a statement to your wedding. You want them to look good, feel good, and compliment you and your groom. This trend is sure to make a statement and set your groom or groomsmen apart from the rest. It is a classy, sophisticated, and fun trend we love! Need more trendy ideas? Check out our Trends We Love series which shines a spotlight on greenery accents, choreographed dances, signature cocktails, and more. And contact Magnificent Moments Weddings, we would love to help your wedding day uniquely you!